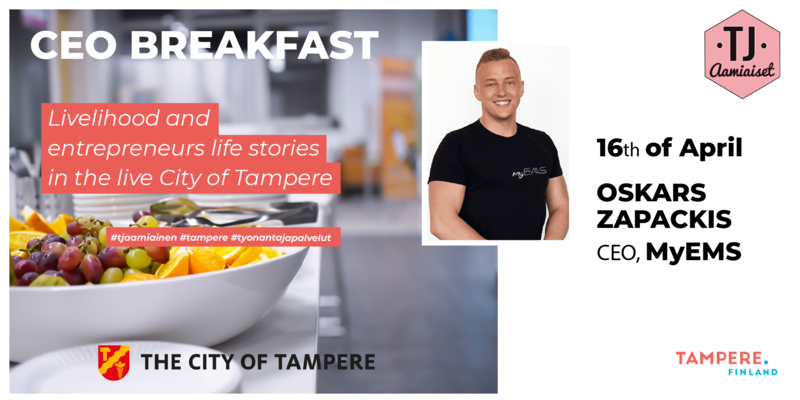 The city of Tampere organizes monthly CEO Breakfasts for entrepreneurs to meet, create new contacts and new business activities. Various service providers from Tampere city are also on site meeting with business representatives and guiding on service tray. CEO Breakfast in April will be opened by Oskars Zapackis, CEO at MyEMS Oy. He will tell us about the network building in Pirkanmaa as an entrepreneur with foreign background. Feedback from CEO Breakfast series has been very positive and provided personal contact with representatives from the city are seen as important. A vibrant Tampere is what we want to see and the city of Tampere is at the service for the entrepreneur! We warmly welcome you to participate in a free discussion on topics you are interested in while having a hearty breakfast. We want to hear how we could serve your business. CEOs´Breakfast is free of charge and will be held in English.